In the following sections, we shall explore the possibilities of using digital drawing tablets in the ﬁeld. Although digital graphics tablets were introduced many years ago, until fairly recently their fragile technology and relatively large size limited their use to more controlled, artiﬁcially maintained environments, wherein high temperature and dust are not an issue, i.e. exactly the situation encountered when working on monuments in Egypt. Let us observe, however, how much the technology has changed in recent years and how we can incorporate them into our ﬁeld documentation eﬀorts. At the time of writing, there is not a single professional grade portable electronic device solely dedicated to graphic work. Any computer that the digital artist chooses to employ in his/her fieldwork will have a complex operating system that allows a much broader spectrum of task management, of which drawing is only one of the possible features. Having a computer in the field requires a steep learning curve and serious customization on the part of the artist in order to be productive and to avoid computer malfunction. To minimize these burdens to the user, most major companies have made an effort to produce some sort of portable computer that is useful for artists, graphic designers, architects, etc. who are working on the go. Designing a portable digital drawing board for such professionals is not an easy endeavor, since they all have slightly different requirements. 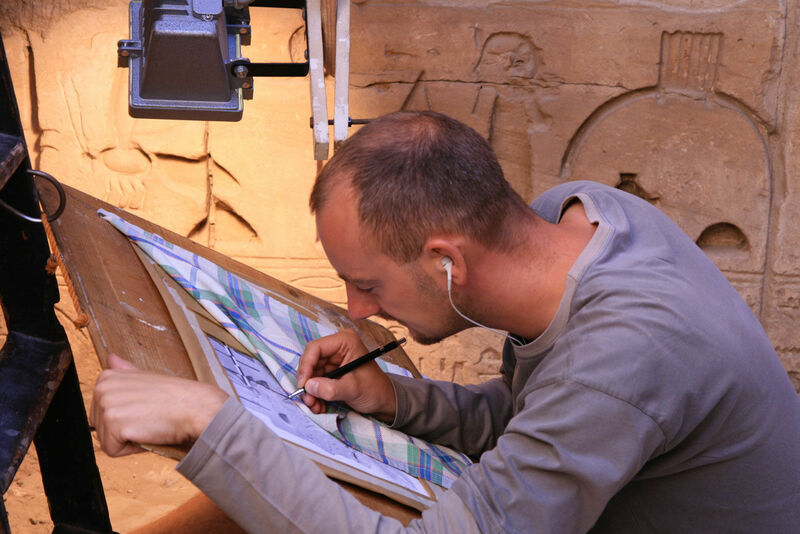 There is, however, some common ground when it comes to epigraphic documentation. First, let us look at the nature of drawing on site and consider what might be the hardware and software requirements for field documentation in Egypt. The general philosophy behind the Epigraphic Survey’s documentation program is at first glance rather straightforward: to transfer and interpret the visual information found on the wall and present it in an understandable form. In most cases, however, this is a much more complex task than one might presume. Professionals often find that it is hard to visualize the multilayered sequence of faded or unclear decorative elements that an Egyptian monument contains. Therefore, it is necessary to rely on multiple representations of the same surface when indicating different types of data, accompanied by long explanatory descriptions. Although when documenting a wall scene, one must strive to indicate as much visual data as possible, prior to the most recent developments of computer technology it was hard to create a complex, multilayered artwork without compromising understandability. 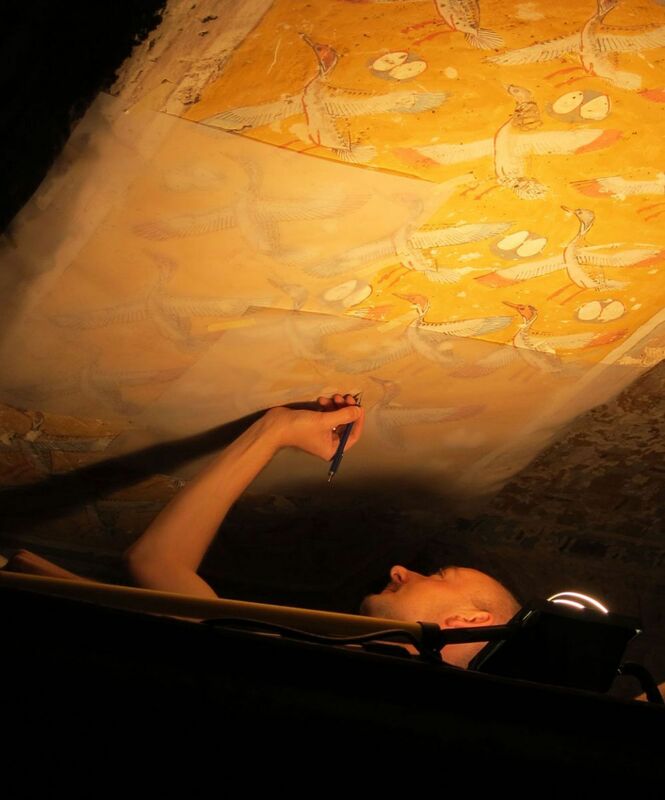 Printing on paper, which is still the most commonly used medium for publishing ancient Egyptian art, does not allow much flexibility in presenting huge amounts of data. 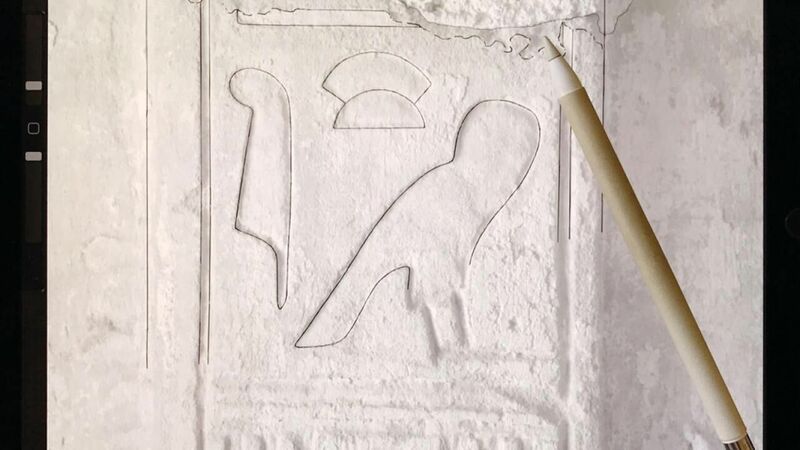 When considering traditional field epigraphy, the epigrapher’s/artist's tools are also very limited: the initial work has to be done either by tracing (aka putting transparent material directly on the wall and following the carved/painted lines underneath) or using a reduced photograph of a wall section as background. The Survey's own documentation method is a fine example of the latter and, aside from being among the most precise and most accurate documentation techniques, it is also considered as one of the least harmful copying processes. Although the Survey has its strictly defined set of guidelines for capturing certain types of decorative elements, even when it comes to fieldwork, it is undeniable that the flexibility of using multiple layers and an extended library of designating information could add a lot to the system. Once enough information is gathered about the available computers and drawing software, the artist can easily draw a list of basic digital tools he/she would welcome when drawing in the field. Naturally, the key to fulfilling all (or any) of these requirements is to find the right balance between hardware and software to be used in the field, so let us first consider what would be the ideal requirements of such machine. Ideally such a device needs to have a relatively large (at least 12 inch), high resolution (minimum HD quality, 1920x1080 pixel-resolution) display that is pressure sensitive (meaning it can register thinner and thicker strokes based on the amount of pressure the artist applies on the screen). The device itself should have the smallest possible footprint. It needs to be ultra-light and thin while accommodating the largest screen possible. It needs to tolerate extreme temperature differences, to be protected against dust, and to have a good internal battery that allows the artist to work without a power outlet for several hours if necessary. A good portable drawing tablet needs physical and/or on-screen shortcut buttons that can be associated with the most commonly used commands that one needs when drawing, similar to the hot keys set up on the Cintiq 22HD, as we discussed in the previous Chapter. A few ports to accommodate or connect external peripherals (USB sticks, SD cards) would be a welcome addition as well. 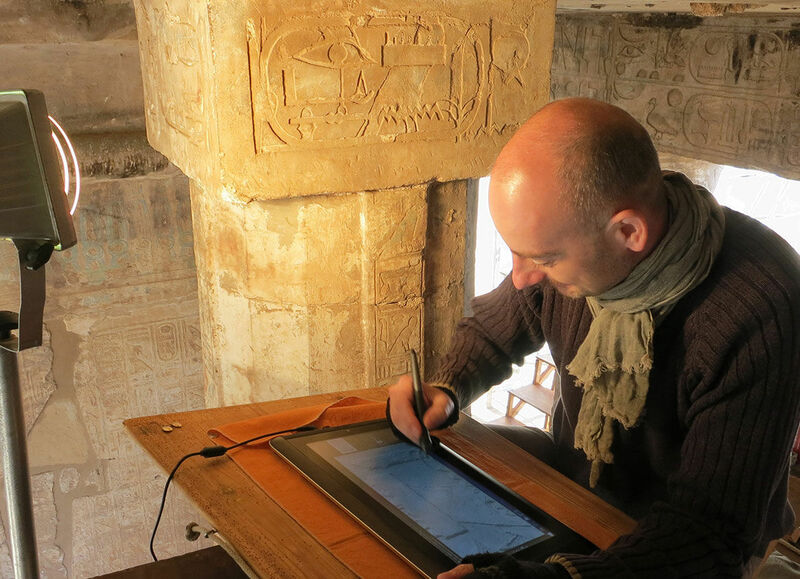 Last but not least, a digital drawing procedure in the field is unimaginable without a good digital pen. A responsive, light, but sturdy pen that feels natural in one’s hand is just as important for satisfactory results as the tablet itself. Ideally, this pen has buttons on the side for further customization, doesn’t need to be recharged for the whole day, and has minimal or no lag when used on the screen. 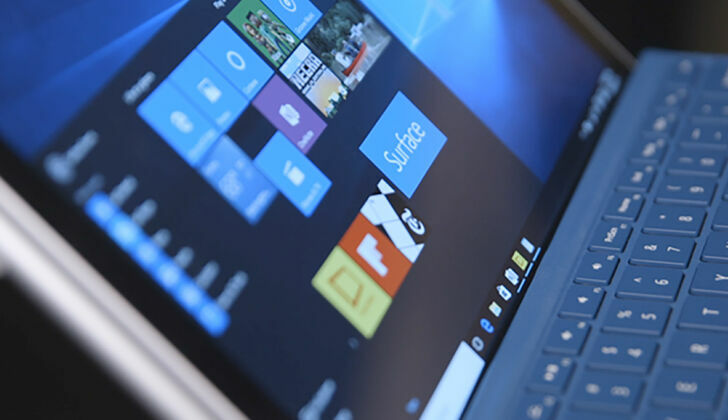 (1)The Microsoft Surface Pro 4 features a 2,736 x 1,824 pixel-resolution (267 PPI) display, which is one of the clearest in its class. 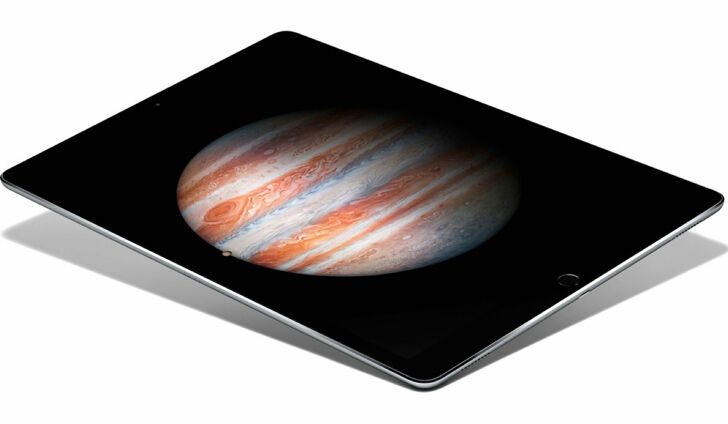 (2)The iPad Pro, made by Apple, is ultra-thin (6.9 mm), only 713 gm, has a 12.9-inch large display, with a 77% screen to body ratio. (3)The Wacom MobileStudio Pro has eight customizable buttons and a touch ring for setting up the most important shortcuts. (4)The Wacom Pro Pen 2 is capable of differentiating in between 8192 pressure levels and has two side buttons for customization. The operating system we use on the field, far from the studio, must be very stable, with no unexpected online updates or other internet activity needed for its daily use. Its layout, buttons, and features must be optimized for the tablet and be easy to operate on a touchscreen, without the need of keyboard, mouse, or any additional external device. The software we use for drawing needs to be able to handle lightweight sketching just as well as complex graphic task management. 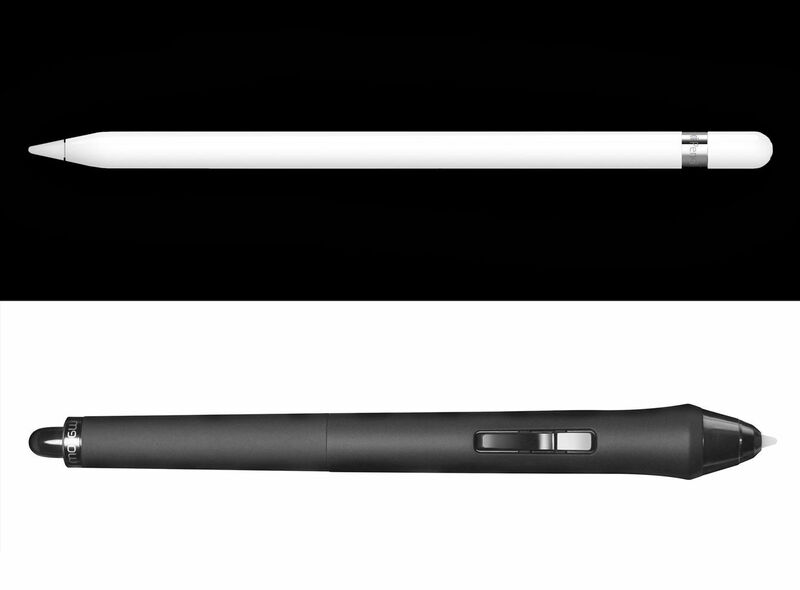 Our digital pencil brush has to be pressure sensitive. Furthermore, the artist very often needs quick access to erase, change the color or opacity, or switch between pencil/brush types and different line weights, as well as to draw straight lines or long curves, use rulers and guidelines, etc., while working on his/her initial version at the wall. 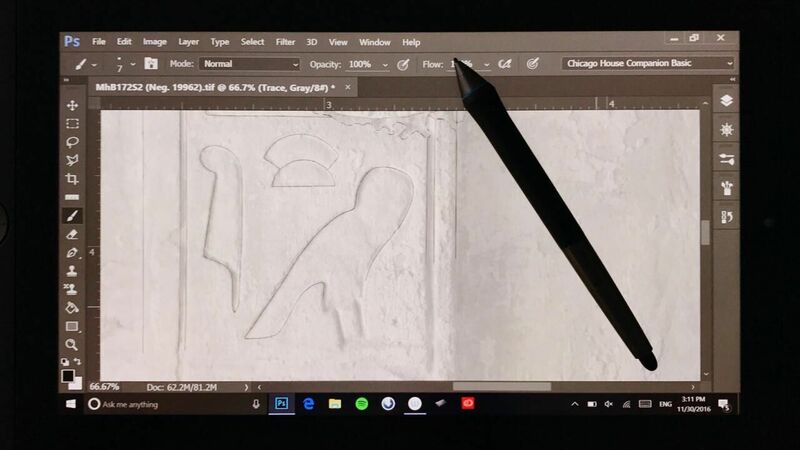 As was already emphasized among the essential Photoshop skills, and as will be covered in greater detail in later chapters, using layers when creating our documentation is an essential part of digital epigraphy. Being able to use layers is one of the most basic requirements of the software when working on portable drawing tablets. Finally, one more important feature, which determines what software we would use and the types of tasks one is able to handle, is performance. The artist has to understand and make sure he/she can be in full control of the program of his/her choice, so focus can be on drawing instead of constantly being frustrated by underpowered or overcomplicated software. 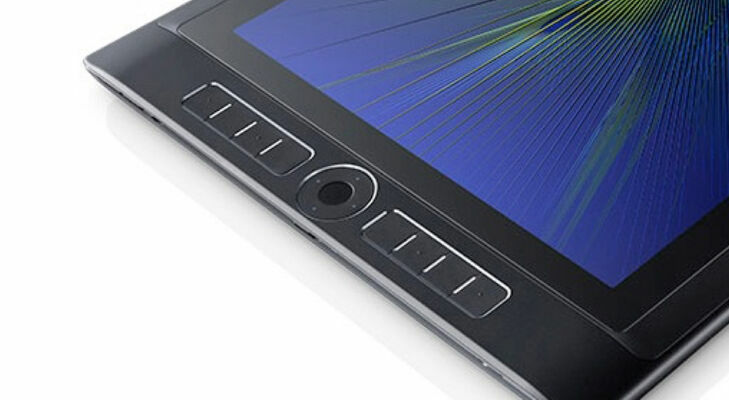 There are certainly many more important features to consider when we decide to pick the right tablet for fieldwork, and, as is often the case, there is no single machine and software combination that would suit every project’s requirements. Nonetheless, in the following sections, we’d like to focus on the introduction of two fundamentally different but equally sophisticated devices and their software solutions, which have been proven effective among the field artist’s arsenal of digital drawing tools. 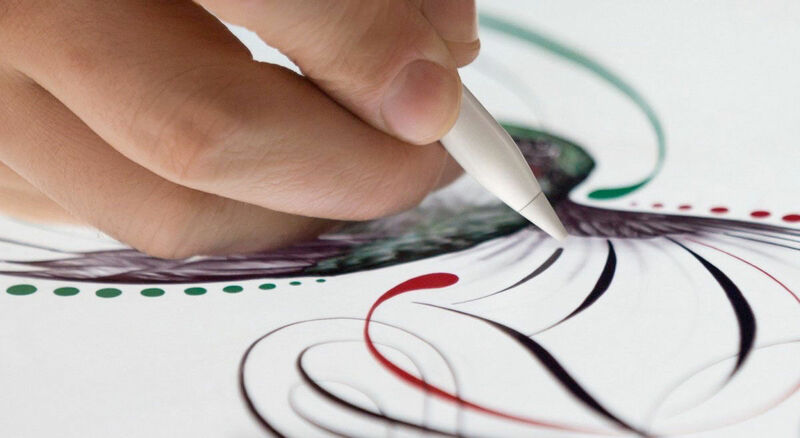 Although Apple’s iPad line, implementing touch screens in larger computing devices, was introduced in 2010, supplying it with an actual stylus and making it a competitive alternative to the Wacom tablet is a relatively new approach.